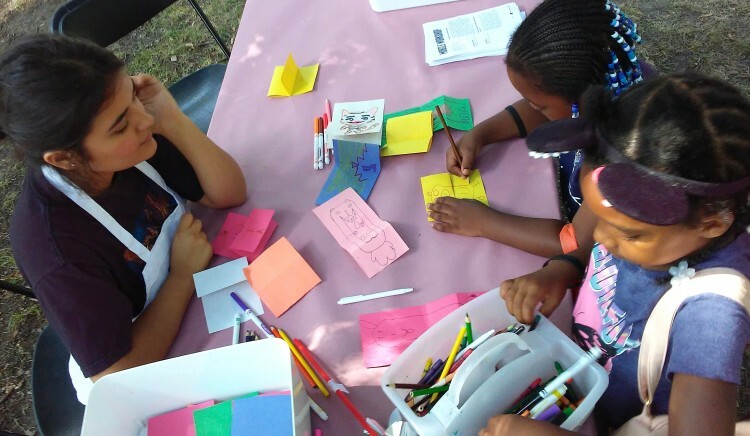 As an Education Intern at ArtPrize, I’ve had the opportunity to plan and facilitate activities with the ArtPrize Mobile Workshop throughout the summer and into the ArtPrize event. As a current student studying Fashion Design at KCAD I’ve always wanted to be more involved in the art community. My time here at ArtPrize has been one of the most positive work experiences, because my involvement with the team has been very hands on and interactive. This has given me the opportunity to learn how the creative process is used in a professional environment. The ArtPrize Mobile Workshop is a pop-up art station that travels around to different locations in downtown Grand Rapids, offering free art activities with repurposed materials. ArtPrize provides families and people of all ages unique, experiential learning opportunities through free activities, events and expert-produced activity resources. Over the summer the ArtPrize Mobile Workshop has been involved in many community events, inspiring people of all ages to create. Here are some of the events we have popped-up at in the summer of 2018! 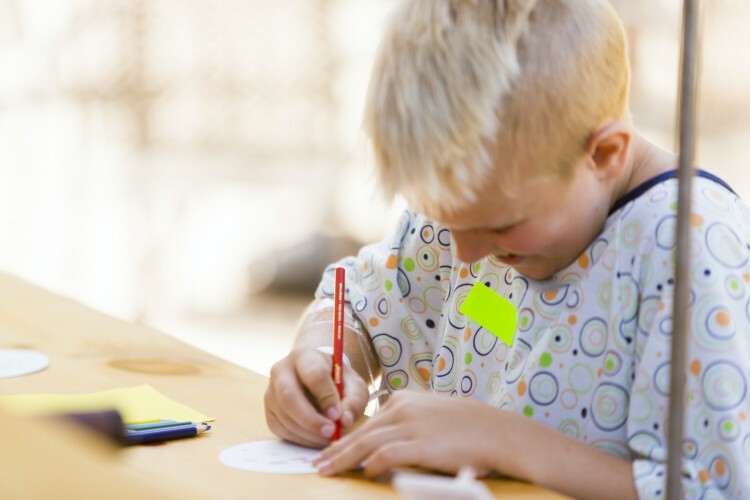 Cultural Heritage Correspondence Activity: Visitors were invited to use writing and drawing tools to start a mail conversation with a person in their life who is an important cultural figure to them. This person could be someone they see on a regular basis or even a person far away. This activity was created in hopes to start a conversation that would give insight on how someone's family experiences culture and the many ways their heritage is expressed. Wonder Turners Activity: People of all ages could create an old-fashioned animation, often referred to as a Wonder Turner. This is created by drawing one half of an image on one side of a small piece of cardstock, and the other half on the other side. Small holes are punched on each end of the cardstock and strings are tied through each hole. Then when spun quickly it combines the two images to create the illusion of one complete image. This was my first event that I was able to help facilitate activities at. I met with Eliza Fernand, the Education Manager for ArtPrize who is my supervisor and mentor and shadowed how she interacted with the community. The Day of Play was a very busy event with constant traffic through the workshop. I was able to teach and help youth with the activity, and I observed their creative process. It’s an inspiring experience getting to see so many young minds create and express their love for the arts. Heartside Has Heart Activity: The community was invited to create a sticker by drawing or writing on a small piece of plastic sheeting, with a sticky foam on the back. A three foot wide cardboard heart was created to as a canvas for the stickers. People wrote and drew messages about their love for the Heartside neighborhood. The heart was then on display in the storefront of a South Division window so people could see it completed and take pride in their community. On the Education team I’ve gotten the chance to work closely with Vanessa, the second education intern. After being introduced to the Heartside event we were given the task to design an activity with limited resources. Together we sat down and brainstormed as many ideas as possible. Revolving our ideas around the resources we had available, while still making sure that the activity would hold significance to the event. We then created the Heartside Has Heart Activity. Hungry Animals Activity: Visitors folded a sheet of construction paper in in a way that hides the inner strip of the paper, then drew an animal with it’s mouth directly on the folds to create an interactive piece that opens and closes, transforming from a little animal smiling to an animal with a huge hungry mouth. Some participants made food or prey going into the animal’s mouth, and some created their own special effects, like a giraffe whose neck grew when the paper opened. Papel Picado Hand-Fan Activity: This activity was inspired by Papel Picado Mexican Folk Art. Visitors were given a vibrant colored piece of paper and were instructed to fold it into an accordion, and to create small cuts on the folds. When opened, an elaborate design is showcased on their very own hand-fan. It was a hot day so the fans were much appreciated! Make Your Own Zine Activity: Visitors were invited to learn how to fold and cut one sheet of paper to create a ten-page Zine, or tiny book. Visitors filled the pages with their favorite things, a story, or instructions for something they know how to do. This book could then be taken home, unfolded and copied to print as many editions as they would like! Fashion in Action Activity: In this activity visitors were invited to draw how they see themselves on a sheet of paper and to then use fabric scraps to design an outfit that is representational of themselves to the truest form. Using a variety of fabric samples and coloring tools, they were able to cut out different shapes and apply them to the paper to design their own custom look. A few weeks into my internship, I was given the task to design my own activity incorporating my major in Fashion Studies. I was empowered to design and run the activity all on my own. The activity I designed, ‘Fashion in Action’ inspired ideas around self-expression and fashion. 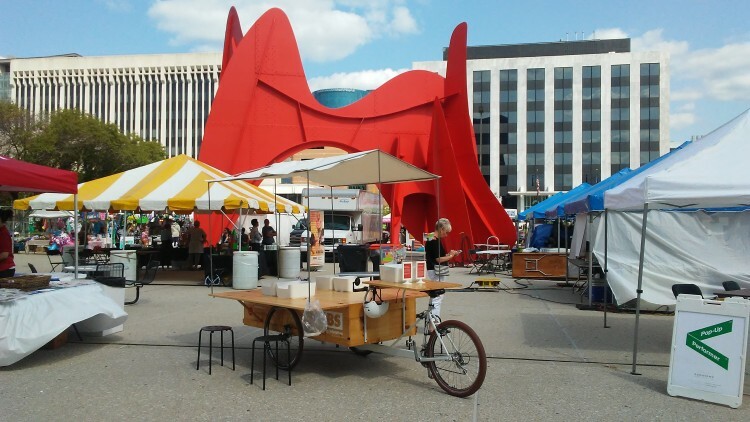 I rode the ArtPrize Mobile Workshop to Rosa Parks Circle and was surprised that the experience riding to and from the event was like a performance! 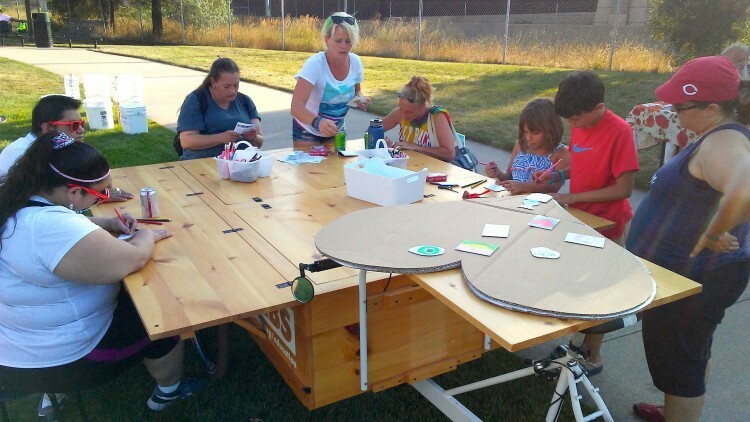 Riding the Mobile Workshop through the city raises a lot of questions with people on the street about what exactly it is and what purpose it serves. It was great to be able to bring my interests into the community and to spread my knowledge. STEAM Education Activities: The mobile workshop made a special visit to the children’s hospital to bring two STEAM activities. Kids and their parents made their own tessellation drawings with repeated shapes, and crafted a color harmony spinner, a top that they drew with their favorite colors on and spun it to see the colors blend together. Digital instructions and materials were passed on to hospital staff to do activities with children who were unable to leave their hospital rooms. 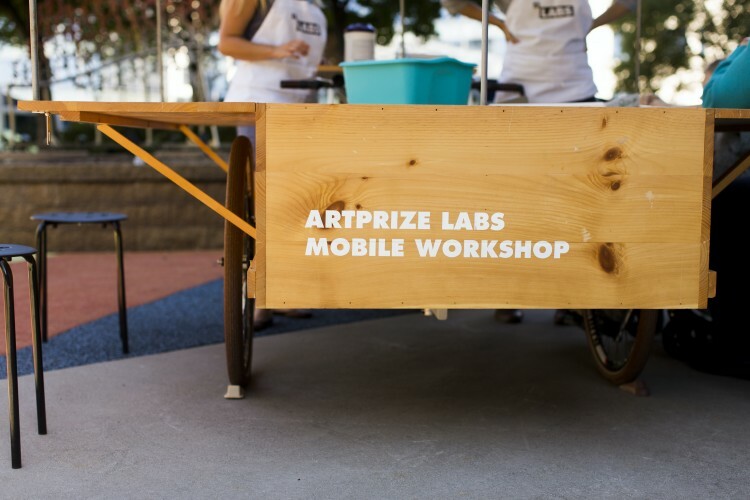 During ArtPrize 10 the Mobile Workshop and the new Mobile STEAM Lab will be appearing in the following locations. See you there! Sundays - Calder Plaza, Noon-6 p.m. This post is part of a series sharing the experiences and perspectives of ArtPrize 10 Interns. Developed by Kendall College of Art and Design of Ferris State University (KCAD) in collaboration with ArtPrize, the ArtPrize 10 Internship Program provides college students from across the region with paid internships and serves as a way to advocate for professional development opportunities for higher education students in art and design related fields. Together, ArtPrize and KCAD are dedicated to connecting young people to the arts through a variety of learning opportunities, helping to foster a sustainable future for the local and national arts communities.